Having grown up around motocross, and with a couple of years on the road on two wheels some 13-plus years ago, throwing my leg back over a motorcycle this past summer was anything but starting from scratch (thankfully). Sure, I was a little rusty to say the least, but the essence of riding isn’t something easily forgotten. After a few quick jaunts, I was back in the swing of things. Though the mechanics and principles remain the same, the new motorcycle market for more novice riders is a completely different beast than it was the last time I was on two wheels. A veritable boom of larger, and frankly more appropriate “starter bikes” is well underway in the form of the 300cc class. These more approachable and rookie friendly rides aren’t like the undersized and underpowered 125s and 250s that have been around for decades, which is a fantastic thing – a serious win for new riders who are on the taller side. Throwing my 6’1 frame over a CBR 125, well, can you picture the bear riding a minibike in a Russian circus? You get the idea. Bikes in this new class are built with standard sized frames, normal width tires, and most importantly, can handle highway speeds without feeling like your life is in jeopardy. You won’t necessarily want to go on a 1,000km (621 mi.) highway road trip on one, but at the very least, if you’re a suburban commuter, they’ll entirely get the job done and save you from having to buy a new bike again after your first season on the road. With that in mind, here’s a look at some of the contenders worth considering. The arrival of these smaller BMWs was a bit of a contentious topic when first announced in 2015, as this was to be the first time BMW moved motorcycle production outside of Germany,. However, putting rubber to the road has effectively put any concerns to bed. Both are powered by a 313cc single-cylinder engine, delivering 34hp up at the top end of its 9,500rpm register. Power delivery in the lower range is a bit more modest and very manageable, making the bike easy to roll off the line smoothly for those still getting used to riding. As much as this engine loves to be revved, you’re going to feel a little vibration from the single-cylinder setup once you creep above the 7,000ish rpm mark, but it’s by no means a severe strike against it. Both the G 310 R and G 310 GS models are comfortable and stable, even at highway speeds, though the lack of windscreen and still somewhat upright posture of the R means you will get blown around a touch more than on its adventure-ready sibling. 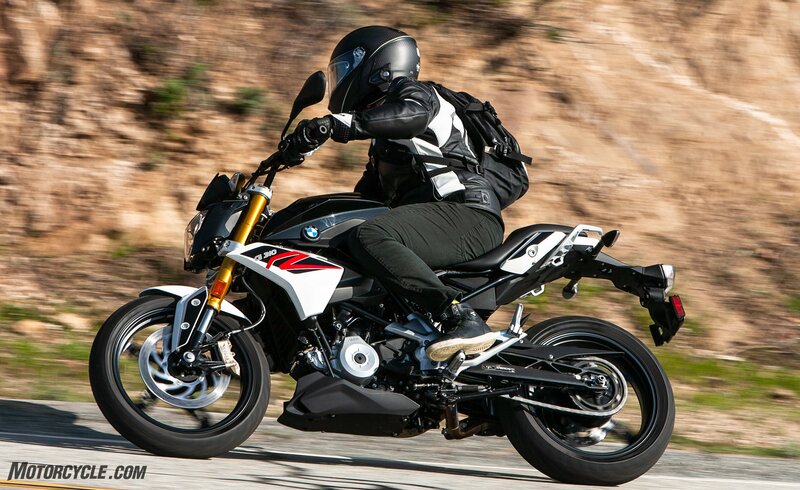 Though effectively in direct competition with the G 310 GS, there are some solid differences between these two bikes. 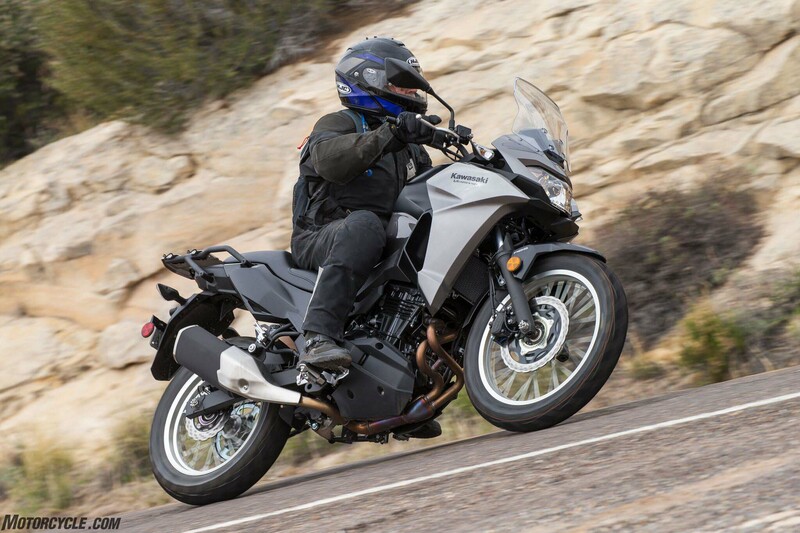 From a powertrain standpoint, the Versys-X is inherently smoother thanks to its twin-cylinder configuration, and the Kawasaki delivers a touch more torque in the lower end. Its clutch is one of the lightest out there, meaning you won’t tire your left hand out dealing with rush hour traffic, but on the flip side, it also means newer riders will have to be more thoughtful when swapping cogs (that’s shifting gears for the truly new riders out there). Rolling off the line is quite painless. However, there’s something about the step from first to second in this bike’s gearbox that makes it a bit more challenging to shift through smoothly. Though it rides on wire-spoke wheels, the Versys’ suspension is tuned a touch more firmly than the GS, which is generally a good thing if you intend on spending more time on the street. That said, if you’re up for a bit of adventure that takes you off the beaten path, its larger 17L (4.5 gal.) fuel capacity will work in your favor. Built as the “kid brother” of the immensely popular R6 and R1, the 320cc parallel twin of the R3 won’t get you into nearly as much trouble as its larger and faster siblings, but in the same breath, it won’t have a hard time putting a grin on your face as you cut through traffic. The 41 horsepower lightweight is even more rev-happy than the Versys-X (whose motor is based on that of the Ninja 300). 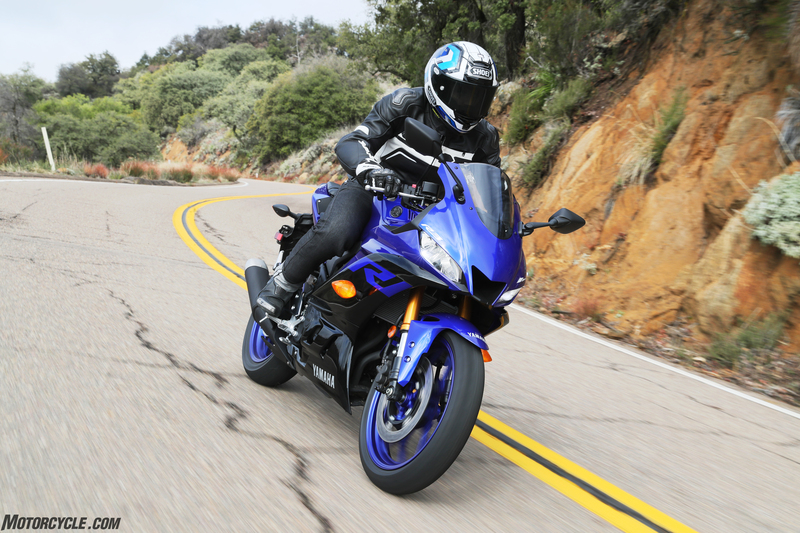 Much like BMW’s offerings, the Yamaha R3 is relatively docile off the line – once again keeping things more tame and controllable for new riders. Getting a little overzealous on the throttle won’t get your into big trouble the way you would with the bigger sportbikes. The best line I’ve heard about this bike is that it’s, in a sense, the motorcycle equivalent of a new Mazda Miata – its quick enough to have all sorts of fun, but as you learn to ride it, you can take it right to its limits, dragging knees when experience and opportunity permits. Easily the most aggressive bike of the pack and geared towards riders that are more obsessed with carving through canyon roads and less about daily commuting, the Duke 390 is a serious riot. Its 373cc engine doses out a fair bit more torque in the lower rev range, meaning you don’t need to wring it out near as hard to get some decent acceleration out of it. Though this model is back to a single-cylinder engine, it’s surprisingly devoid of vibration through to the upper rev limit. The bike rides on a fairly short wheelbase and stands at a fairly tall seat height, giving it a more supermoto-esque riding position. That said, the Duke won’t be too big of a bike for riders in the low 5-foot range. In trade, you get a fairly firm seat (more so even than that of the Kawasaki) and a rather stiff WP suspension (inverted front, and monoshock rear) that aids it through the bends but makes it a touch more abusive if your commute involves rougher pavement. 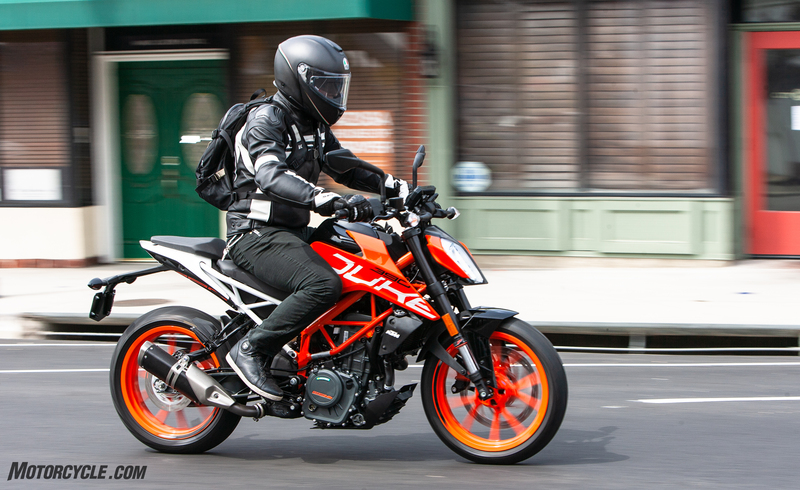 If you were to throw it up against the G 310 R, you’ll be more comfortable on the Beemer day-to-day, but the KTM would outpace it on weekend rides through the twisty bits. Honda’s latest entrant in the class, the CB300R is dubbed with an interesting “Neo Cafe Racer” nomenclature, as the firm’s designers tried to channel how the vintage cafe racer category could evolve into the future. Visually, it’s quite slick, and its short tail, broad exhaust, and round aluminum-trimmed headlamp are a little reminiscent of the Ducati Monster. Back to a single-cylinder thumper, the young-adult sized Honda delivers a solid ride and a comfortable riding posture. It’s a touch more compact than some of the other category entrants, mind you, but all told, even a larger rider won’t feel too goofy throwing a leg over it. The 286cc single uses a counterbalance shaft to even out the expected vibration, doing so rather efficiently overall. The CB’s suspension setup, like many in the pack, strikes a nice balance of comfort without feeling too soft and wallowy, plus its rear shock offers a 5-step preload adjustment. 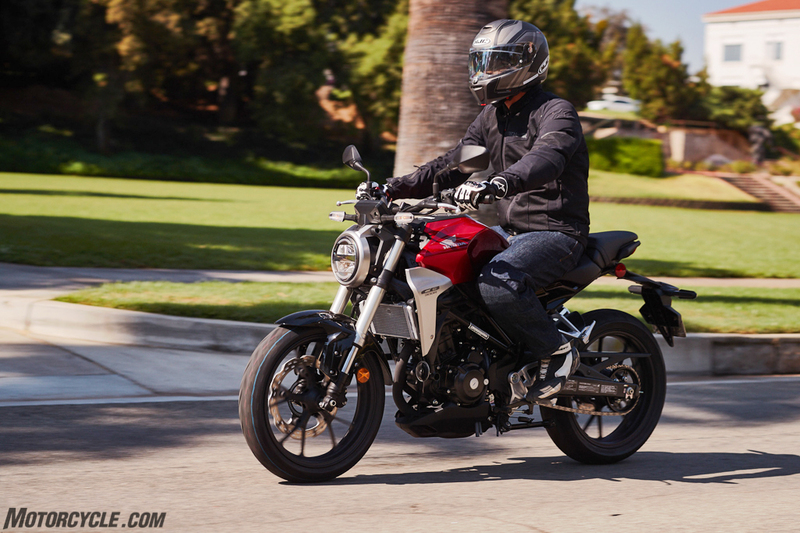 While this only one of 4 contenders in this class from Honda (to mention the Honda Rebel 300, CBR300R, and CB300F), it presents as a bit of the “Goldilocks” bike of the pack, being less aggressive than the CBR300R, less cushy than the Rebel, and a touch more advanced than the lower spec CB300F.